This is without doubt the best Macaroni and cheese I have ever had….no jokes! We had talked on the phone and decided to make mac ‘n’ cheese, she explained that it wasn’t plain mac ‘n’ cheese, we would need shrimps, prawns, crabs, lobster….my mouth fell open as I had never had such and all I could think about was the price of seafood in Lagos, I asked ‘what kind of rich-man mac ‘n’ cheese is that?’ But she goes, don’t worry, we just need a little of everything…. Elbow Pasta, milk, shrimps, prawns, cheese (cheddar, parmesan, gouda), butter, spring onions and flour. Next, we boiled the pasta, made a roux, grated all 3 cheeses and stirred a little amount of each in with the pasta…. 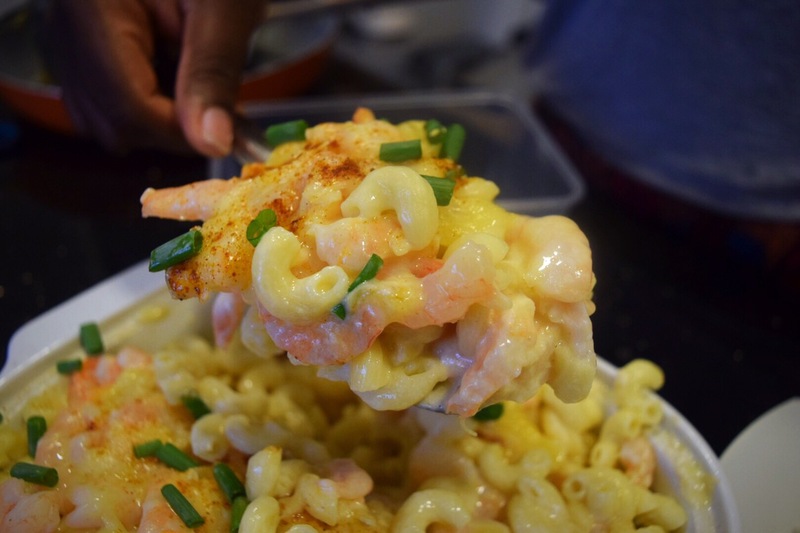 Then we plated into a baking dish in the order of pasta, shrimps and cheese…. This was so good….cheese overload! Hmmmm. I am not crazy about cheese but seeing this makes have a rethink. Thanks, I”ll give this recipe a try this weekend.